Disclosure: This Easy Refreshing Apple Buko Salad post is sponsored by Ontario Apple Growers but all photos, words and opinions are mine. Thank you for supporting the brands and organizations that support me! 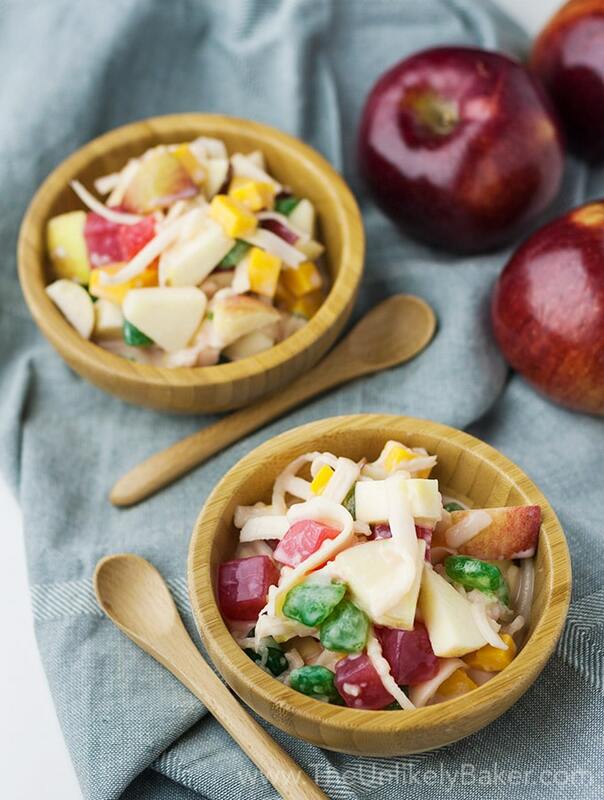 Apple buko salad is a fresh take on a classic Filipino holiday dessert. Made with young coconuts and gorgeous Ontario apples, it’s sweet, tangy, red, green, delicious! Christmas prep is in full swing in the TUB household. The tree is up (who am I kidding, you guys know it’s been up for a while now lol! ), presents are starting to pile up waiting to be wrapped and we’re close to finalizing the holiday menu for the different parties we’re hosting this year. Apple buko salad will make an appearance, of course. Like Filipino Style Spaghetti, Ube Cake and Brazo de Mercedes, it’s one of those dishes that we grew up eating around the holidays (I remember there’s always buko shortage just before Christmas Eve and New Year’s Eve, which is a serious matter in a land of coconuts!). It’s a refreshing, sweet and wonderful dessert to cap a sensational holiday feast. Traditional buko salad is usually made of young coconut plus a can (or cans) of fruit cocktail. Fresh fruit like apples, oranges and pears are not organic to the Philippines and therefore a little expensive so a lot of Filipinos turn to the cheaper, canned alternative. Luckily, I now live in Ontario where apples are not only abundant but affordable too. Fact: there are 15 different main varieties of apples grown on nearly 16,000 acres in Ontario! So many apples, so little time. You can read more fun apple facts here. I love apples fresh but especially love them in desserts (have you seen my Apple Galette or my Salted Caramel Apple Cheesecake?). This time I paired apples with young coconut to make a beloved Filipino dessert. For this apple buko salad, I wanted a crisp apple – one that would not get soggy submerged in all that delicious milky dressing. I knew crisp apples would also lend a wonderful texture to the salad. Armed with a single apple goal, I went to go buy my Empire apples (quick tip: look for the Foodland logo to make sure you’re buying Ontario apples) and started to recreate a childhood favourite. And you know how food has that magical ability to transport you? That’s what happened when we were making this. It smelled like Christmas, it looked like Christmas and it tasted like Christmas! It brought us back to a time of love, family and simple joys. Who knew a humble apple buko salad can do that? This holiday season, amidst all the chaos that is our lives, I wish you all quiet moments filled with simple joys. And how about some apple buko salad while you’re at it? It’s quick and easy to make, no baking, just stirring, and it is delicious. 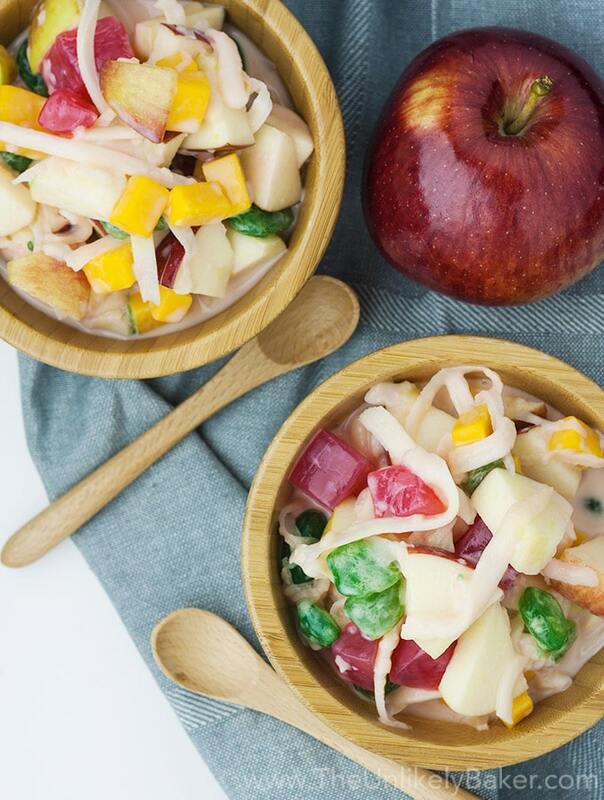 Apple buko salad is a fresh take on a classic Filipino holiday dessert. Made with young coconuts and gorgeous apples, it’s sweet, tangy, delicious! In a large bowl, mix all ingredients (except the milk and cream) together. In a smaller bowl, whisk condensed milk and table cream until combined. Pour over fruit and stir. Chill before serving. If fresh young coconut is not available, you can buy frozen grated coconut from Asian stores or the international aisle of your supermarket. Just thaw according to package instructions. You can also find sugar palm and coconut gel in Asian stores, the international aisle, or online. Look for the Foodland logo to make sure you’re buying Ontario apples. Did you make apple buko salad? What’s that one dish that reminds you of Christmas? I’d love to hear from you in the comments section below. Previous Post: « Filipino Style Spaghetti – Sweet and Salty! Hello my friend! I wish to say that we tried this recipe for holidays and it was delicious! Unique way to partake of apples. Thank you very much have a nice day. 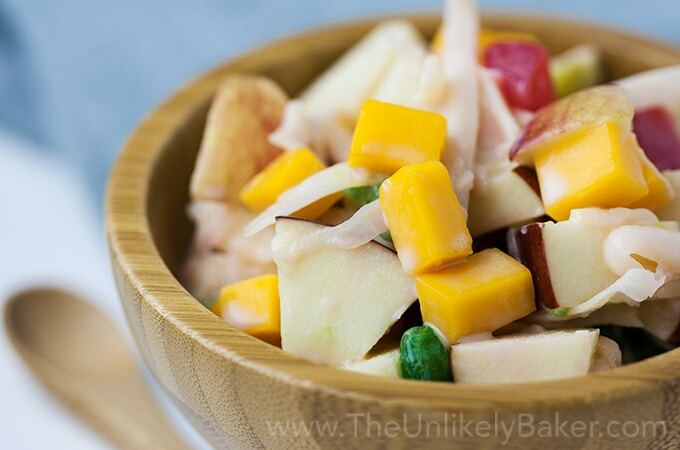 This is certainly a refreshing looking apple salad and looks super tasty indeed. I’m not a fan of canned fruit, so I always use fresh when I’m preparing a fruit salad. Yours looks super tasty. I really want to eat some apples right now!! What a fun and unique salad! Sounds quite yummy and it looks pretty! This looks mouth watering and definitely very healthy too. I too love fresh fruits over canned ones while making a salad and I love salads! Thanks for sharing the recipe! that sounds delicious and healthy… I’ll remember this for my healthy, fresh snacks… thanks! What a unique and delicious salad with such pretty colors!! Forget the salad !! I’d make this as a dessert. Fruit in the wintertime sounds so good, especially with all the sweet desserts. Apples in the States are finally coming down in price. Yay!! You’re in luck Marisa! This “salad” is actually a dessert 🙂 And yay for lower apple prices! Yummy! This recipe looks amazing. I love easy healthy recipes, and this one I would definitely try making it soon. Thanks for the inspiration! What a refreshing recipe. I have never heard young coconut meat referred to as buko. Up until a few months ago my neighbor had a huge coconut tree that would litter the yard with fresh coconuts. One of the first things I did as a child when we moved to Florida was crack open a fresh coconut and drink the coconut water. Having moved from New York to Florida it was one of the most exotic experiences of my childhood. Hi Arlene! Buko is just the Tagalog word for young coconut 🙂 And now you’re just making me feel jealous! My grandparents had a coconut farm where we would drink fresh coconut juice and eat fresh coconut meat. Ahhhh it was wonderful 🙂 Now I just have to make do with frozen LOL! We have this at home! My mom usually makes this dessert! Great recipe! I’ll try your version. Awesome! Do you guys put Queso de Bola? I would have loved to put some but it’s ridiculously expensive here!! The apples are a wonderful change vs. the canned fruit though. Hope you like it! I love new dishes. I really want to try this. I love using fresh ingredient especially fruits in a dish! 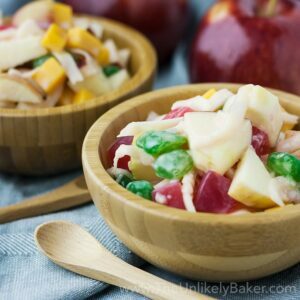 Would love to try Apple Buko Salad, since California we do have great fresh apples year round and this seems great recipe to try! a healthy and easy alternative for breakfast. Can be made in minutes, i am surely going to add this to my recipe lists. That looks amazing and so fresh! This salad looks delicious and fresh which is a welcome change from all the heavy holiday food. This salad seems like it tastes amazing! I am going to have to give this a try. What a simple recipe. I too love using fresh apples. Definitely gonna try this soon. This sounds delicious. I actually really like eating apples with cheddar cheese, I thought I was sort of weird for eating them like that but I guess I’m not the only one! Hi Liz! It think it’s not weird at all 🙂 They go great together. Hope you’re having lovely weekend! Such and interesting recipe. I love apples in my salad but I have never added condensed milk and coconut in my salad. I cannot wait to try this. I love coconut so this definitely sounds yum! Hi Veena! I think Filipinos have a love affair with condensed milk. It seems we put it on everything lol. Hope you like this salad! That salad looks so perfect – sweet but not too heavy. Yum! MY family absolutely loves apples! Your salad sounds and looks like a perfect addition to an upcoming meal in my house! Okay, this looks AMAZING. What a great combination of flavors! Wow this recipe looks absolutely delicious and I can’t wait to give it a try!! I have never heard of anything like this! It sounds amazing. I love how bright the salad is. Apples are cheap and easy to get here too! You’re in luck! I loveeeee apples too 🙂 I have some really great apple recipes on the blog. Hope you find one you like! You always have the most interesting recipes to me! I checked out that apple guide and we love Fuji’s which of course are the sweetest but I think I’m going to try some Honeycrisp which seem similar but maybe not so sweet. I’m going to have to make this for my son. He’s the apple lover in our family. Hi Denise! I really love that guide. It’s so useful right? I never used to know what to buy. Now I have that bookmarked on my phone 🙂 Hope your son (and your family) enjoy the salad! With abundance of apples in North America canned fruits is no longer an option..for sure this will be in my Noche Buena spread. I agree! I actually never liked the taste of the local fruit cocktail my mom used (shhh don’t tell her lol!) This is a much better version 🙂 Hope you enjoy it! What a delicious and healthy salad! I would eat this all the time for lunch! This reminds me so much of an apple salad my grandmother used to make. Right down to the cheese cubes! Oh how i miss buko salad! I think these fruits are good combination and taste really delicious! Hi! Are you a Filipino living abroad too? This is a really great version of buko salad if I say so myself 🙂 Perfect for Christmas! Oh yum! I’m definitely liking the apple with the coconut flavors. I think this sounds delicious! I am loving this salad recipe! Sounds so good for a side for dinners! Love that you used fresh apples over canned – so much better!! Haven’t had a salad quite like this before, but all the flavours sound delicious! It’s nice and light and a good break in between the holidays indulgences. Wishing I had some apples left on my tree to make this….looks like I’ll have to make a trip to the grocery 😉 Have a great week, Jolina! Hey girl! (I can’t believe I only saw this now, it’s been that cray cray). There you go again making me all jealous of your lovely apple tree lol! Have a great week too! Congrats on the sponsored post. This salad would be great as a brunch item during all the holiday get togethers. We need to eat healthy sometime…and this sounds delicious. 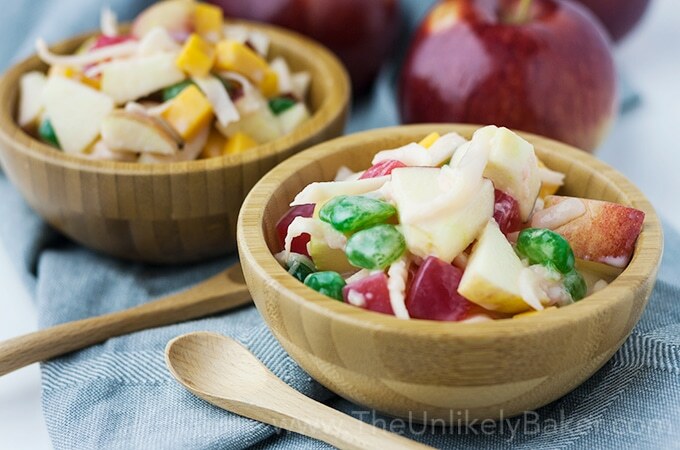 This apple buko salad looks so yummy! I can’t wait to make this for my family. We eat so many fresh apples all year round (we’re lucky in the fall to have an abundance of farms that grow apples.) This salad looks delicious!